Who Is A Business Analyst And How To Become A Business Analyst? A business analyst is a specialist who investigates the customer’s problem, seeks a solution, and formalizes its concept in the form of requirements, which will be used by developers in the future when creating the product. Who is a business analyst and what is the essence of this job? The main task of the business analyst is a detailed study of the structure of the company, the search for problems, and the best ways to solve them. Most often, business analysts analyze the financial activities of the organization, develop a new or improve the old business model, optimize the process of work, and do their best to increase the company’s profit. The business analysts are needed for large enterprises, banks, construction organizations, and, of course, IT companies. For example, the client, who has problems selling his product, contacted the company. Business analyst needs to find out why this happened – low-quality content on the website, high prices, a complex interface, lack of communication in social networks, etc. The business analyst then describes in detail the results of his research and suggests a solution to the problem. Being a business analyst is a creative work – you need to understand what the customer needs, see the ways for realizing the idea, offer new solutions for the development of the company, decide which technologies will be used in the work, etc. The business analyst is the creative person of the team because he passes the requirements of the client to the developers and prepares them properly. At the same time, the business analyst should be able to politely communicate with the client and resolve conflicts, be careful and attentive to the little things, be able to present the project in its final stage and be two steps ahead. Read this essay for college admission about the profession of a business analyst to learn more about other qualities you need to have to become a business analyst. Methods of project management are one of the key requirements that employers make. In simple words, project management is the management and organization of all processes that will lead to a goal, be it a competitive analysis or a marketing campaign. The difficulty is that all projects are different, which means that everyone needs their own approach. For this, a whole system of project management methodologies was developed, and, of course, employers will require this knowledge. The main task of the business analyst is to identify the problems of the customer’s business and find the most effective solution. To do this, you must have knowledge of the subject area. The business analyst works with requirements at all stages of the software development life cycle and constantly acts as an intermediary between the customer and the team of programmers. Identify the needs of the customer, understand the problem that he wants to solve. Independently or with the help of the team formulate the concept of solution. Formalize the concept in the terms of reference with specific requirements for the future product. For this, various techniques of business analysis are used – building of models of processes and structures, prototypes of the user interface, and usage scenarios. At the same time, an accurate assessment of labor costs and duration of work is done. Detail each requirement in the form of specifications. Advise programmers and testers during the development of the product, negotiate disputable issues with the customer. The circle of tasks can be described in simple words: working with requirements. This implies both interaction with interested parties on the side of the customer and with team members who are responsible for the process of developing the solution. In large projects, the roles of the Business Analyst and the System Analyst are sometimes shared. The responsibilities of the Business Analyst is to identify the business objectives of the customer, think through the concepts of the solution, and form the requirements. The responsibility of the System Analyst is the formalization and specification of requirements, the writing of a technical task at the level of functional requirements and software implementation. Broadcast requirements between developers and the client. An analyst can be very communicative and write perfect documentation. But if he does not understand the subject area, he cannot understand the customer and bring it to the developer, then his projects will fail. The main advantage of the business analyst profession is the ability to penetrate the essence – to understand how everything is arranged, what parts it consists of, how they relate to each other and interact, and then describe complex things using simple but useful models. Business analysts help different parties understand each other, and as a result, they get an implementation that will satisfy everyone. Among the shortcomings are the difficulties in communicating with the customer, when it is not possible to convey good ideas or to interfere with restrictions in terms and budget. Another complaint is the need to study large amounts of information in a short time. In addition to studying the project directly, the business analyst must constantly keep abreast of new methodologies, approaches, and learn the basic principles of new platforms. Disclosure: We are a professional review site that may or may not receive the compensation from the companies whose products we review. Some posts in this website contain affiliate links. We test each program or network thoroughly and give high marks to only the very best. We are independently owned and the opinions expressed here are our own. Join over 3.000 visitors who are receiving our newsletter and learn how to monetize your website. We are mainly focused on reviews of online ad networks and affiliate platforms. Please stay connected. We hate spam. Your email address will not be sold or shared with anyone else. 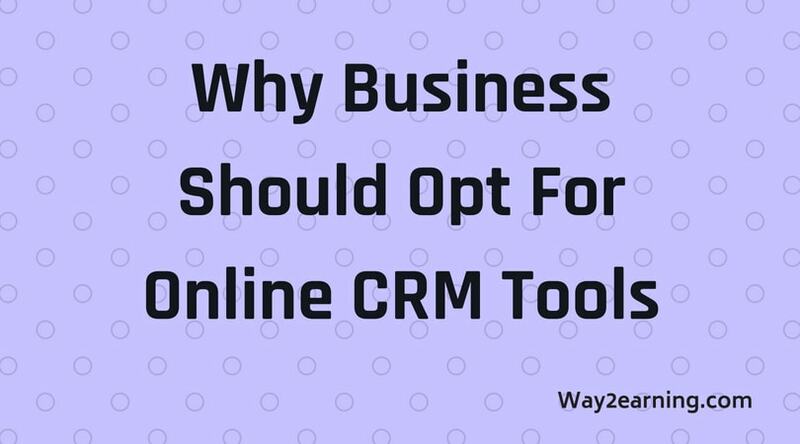 Why Business Should Opt For Online CRM Tools? Suresh is author and owner of way2earning.com. He loves to help people by teaching the ways to make money online with advertising and affiliate programs. He is also passionate about technology and love to write reviews. Do You Need Hosting For Your Blog/Website? We will help you to choose the hosting and domain name in your desired budget. We can suggest you the best hosting service. Contact us for the same. Once you buy the hosting, we will help you in setting up blog or website. Way2earning covers reviews of online ad networks, recurring affiliate programs, URL shortening networks, popular affiliate networks, blogging, WordPress, affiliate marketing, cryptocurrency and many more. We proudly say that way2earning.com helps website owners and bloggers in finding right monetization channels. Please Contact us for advertising and sponsored content collaboration. 1. The business links are not allowed in the guest posts. 2. We accept high quality, unique and relevant content. 3. The link in the content must be the homepage of your website or blog. 4. We do not accept content writers or link sellers. If you think you are fit for submitting guest post , then contact us at the earliest. Signup today for free and be the first to get notified on new updates. Copyright © 2019 Way2earning All Rights Reserved.